Modern-day couple, Shruti and Nikhil, met on the dating app Tinder and got along immediately from their first date. Shruti says they both have loud and fun personalities, and they meshed together instantly. A year and a half later, he proposed to her in Kenya. It was a trip for Shruti to meet his family, and it ended in a proposal. He asked her the big question on a hot air balloon over the jungle, and when they returned for lunch, he had surprised her with many of their close family and friends there to celebrate! 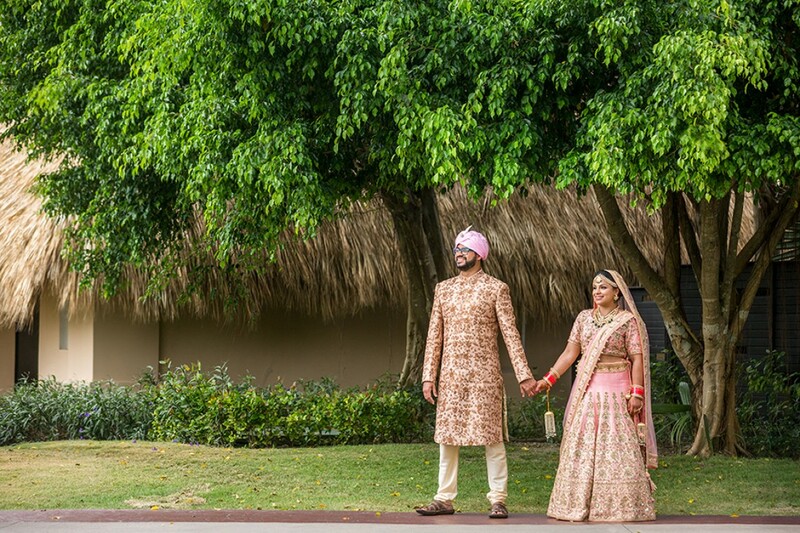 Shruti is a wedding coordinator herself and had some particular ideas for her wedding. For one thing, she knew that they wanted to take control of everything. They didn’t want their families to spend a ton of money or even the bridesmaids to help plan so that everyone could simply enjoy the wedding. They landed on a destination wedding because of this, something that makes it a bit easier if some people can’t make it. Destination weddings create more of a feeling for guests that the wedding is optional and not mandatory, while also being affordable since it’s at an all-inclusive resort. They also had learned from former weddings of friends and families. Her brother’s wedding had 1000 guests, and she knew having that many guests wasn’t for her. The couple worked with Brandi, of Destify, because Shruti knew her from former projects. “The person who coordinates becomes the person who understands, it’s like they become your best friend.” At the end of the planning, they had 200 confirmed guests, and a better understanding of what the total costs would be in the end. Looking back, Shruti reflects on the importance of not letting stress get to you so that you can enjoy the day. She says that you work so hard for this one event, you have to not let something that may go wrong or be different than you expected change how great of a time you have. Everything that you stress about, that feels like such a big deal, it’s not! Everything will be fine!